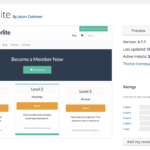 Browse documentation below to learn how to configure the Memberlite Theme. This section demonstrates how to update the layout and design of your site’s title, tagline, logo, and site icon…. 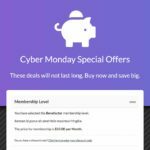 Memberlite has many theme customization options that you can easily manage via the ‘Appearance’ > ‘Customize’ screen in the WordPress admin. The customization options listed under ‘Memberlite Options’ are covered below…. This section demonstrates the various design and layout options available for your content. Dynamically add, remove and adjust settings for the widgets on the selected page in the Customize preview area or via ‘Appearance’ > ‘Widgets’ in the WordPress admin…. Memberlite includes four default theme locations for defining site navigation. You should also set a menu for smaller screens / mobile visitors by adding the ‘Custom Menu’ widget to the ‘Mobile Menu’…. Easily select a built-in Color Scheme or change the site’s color scheme manually by modifying the colors under ‘Appearance’ > ‘Customize’ > ‘Colors’…. Memberlite allows you to set a ‘Background Image, ‘Header Background Image’ or define the background color for your site via ‘Appearance’ > ‘Background’…. These are the post formats available and how Memberlite will adjust the post’s appearance based on format selected…. If you need to customize the theme beyond the settings available in the Customize Screen, use a child theme…. A list of action hooks available in Memberlite to allow you to ‘hook into’ the theme templates and call functions or add content at specific times…. A list of filter hooks available in Memberlite to allow you to modify the appearance of specific theme elements via custom functions….